Calling all party animals! Grab your dancing shoes and get ready to get down in the awesome 20-payline Super Jackpot Party slot machine from WMS Gaming. Originating in land based casinos, you may already be familiar with the hip disco tunes belting out of the machine. One more than one occasion I've caught an extra hop in my step while walking the aisles! Calling all party animals! Grab your dancing shoes and get ready to get down in the awesome 20-payline Super Jackpot Party slot machine from WMS Gaming. Originating in land based casinos, you may already be familiar with the hip disco tunes belting out of the machine. One more than one occasion I’ve caught an extra hop in my step while walking the aisles! The slot is very colorful with its party atmosphere. You’ll find solo cups, gifts, tropical styled drinks, balloons, party streamers, a disco ball and a variety of 7’s on the reels. The game also features an incredible amount of awesome party sounds, from typical party noisemakers, to catch disco tunes to familiar songs like “Celebration” by Kool & The Gang in the Pick me bonus feature. One thing is for sure, this slot will have you “Celebrate good times…” so come on! Disco Ball Wilds – The Disco Ball is the wild in this slot machine and will match all symbols except the two feature trigger symbols to complete winning combinations when possible. Wilds appear on reels 2, 3, 4 and 5. 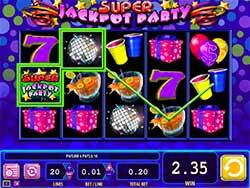 Pick’em Party Bonus – The scatter symbol in Super Jackpot Party is the one with “Party” written across it. Getting three of these symbols which show on the 1st, 3rd and 5th reels will trigger the Pick’em Party Bonus. In this round you will get to pick presents to reveal your instant cash prizes. You can also trigger mini games during this round like the “Whack a Pooper” which gives you three characters from which you choose one to whack and win another prize. You’ll return to the base bonus game and continue to pick presents until the Pooper rears its ugly face and you go back to spinning the reels. Multiplier Feature – In the Party Bonus, if you pick a Multiplier in a gift box you’ll win that multiplier on the next one to three presents you pick. You can win up to a 10x Multiplier in this round!